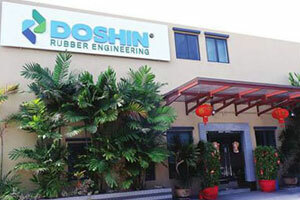 Congratulation to Doshin Rubber on achieving the certificate of constancy of performance 1835-CPR-41-0054. Seismic Isolators HDRB and devices produced by Doshin Rubber Engineering are now CE Mark Certified manufacturer outside of European Region. 1. Today, YB. Datuk Seri Mah Siew Keong, Minister of Plantation Industries and Commodities, visited Doshin Rubber Products (M) Sdn. Bhd., a Malaysian-owned rubber manufacturing company, which is one of the largest manufacturers of engineering rubber products. Doshin not only manufactures products utilised in infrastructure projects such as marine dock fenders, expansion joint systems, structural bearings, and mining-related products, but is also a major player in earthquake protection and vibration insulation industry. 2. The objective of YB. Datuk Seri Mah’s visit to Doshin Rubber is to get better insights into high-value engineering rubber products manufactured and exported by Malaysia and the export potential of these products in global markets. 3. Malaysian manufacturers have installed and supplied rubber seismic bearings to other high-seismic activity countries such as New Zealand, Iran, Portugal, Indonesia, Turkey and China. Importantly, Malaysian manufacturers of engineering rubber products are certified to international standards such as ISO 9001:2015 and ISO 22762 for elastomeric seismic protection isolators and tested by laboratories with ISO/IEC 17025 certification. 4. High-Damping Rubber Bearings (HDRB) are devices which contain layers of specialised intelligent rubber compound and reinforced steel plates. Buildings and bridges equipped with HDRB technology are able to withstand the impact of an earthquake better by deflecting off earthquake vibration forces. 5. 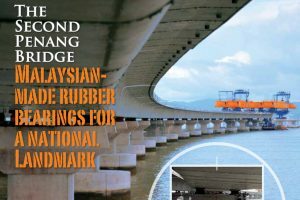 In Malaysia, High-Damping Rubber Bearings were installed in the 2nd Penang Bridge, the longest bridge in the world to be mounted with over 2,000 pieces of HDRB. In Indonesia, Doshin’s patented Ultra-High Damping Rubber Bearing System is used in isolating a university hospital and the Wika Tower. This marks the first time such a system is used in the world which utilises natural rubber compound with ultra-high damping ratio without the help of other expensive devices to achieve the same satisfactory performance. 6. We recognise the importance of protecting buildings and bridges especially in earthquake-prone countries.The ten most earthquake-prone countries include Japan, Nepal, Philippines, Pakistan, El Salvador, Mexico, India and Turkey. The impact of earthquakes is devastating with lives lost and damage to property, The cost of rebuilding can reach billions of dollars. 7. Of the many designs of base-isolation systems that are available today, High-Damping Natural Rubber Bearings (HDNRB) offer the simplest and most cost-effective method of isolation to avert and minimise losses due to earthquakes. HDNRB also require less maintenance. Recognising the potential demand of these products to save lifes and avert high economic damage in the event of an earthquake, the Malaysian Rubber Export Promotion Council (MREPC), has been undertaking intensive marketing efforts in several earthquake-prone countries such as China, Turkey, Chile, Peru and Myanmar to promote the adoption of HDRB in buildings and bridges. 8. In 2017, MREPC together with industry members, will be promoting HDRB in Indonesia by conducting seminars on the product in Jakarta and Medan, Indonesia. Meetings with the relevant authorities and engineering organisations will also be held to promote the use of HDRB in infrastructure projects. MREPC has also identified several high-seismic activity countries such as New Zealand and the Philippines to promote HDRB. 9. Malaysia’s export of structural bearings rose by 36.2% to RM14.14 million in 2016 from RM10.38 million in 2015. Structural bearings, categorised as technical products in the general and industrial rubber goods sector, have shown significant improvement in terms of export in recent years. In 2016, total exports of rubber products in the general and industrial rubber goods sector increased by 4.9% to RM1.92 billion, from RM1.83 billion in 2015. Malaysia’s ability in producing high-value engineering rubber products used in the field of vibration and earthquake engineering, is the result of collaborative efforts between the Malaysian Rubber Board and the rubber product industry. 10. Over the next few years, Doshin will focus on specific products such as the Ultra High-Damping Rubber Bearing and advanced vibration insulation system for high-speed rail. In fact, High-Damping Rubber Bearings (HDRB) produced by Doshin Rubber for the protection of buildings and earthquakes have been installed in buildings and bridges in Malaysia and abroad. Doshin Rubber has also invested in installing highly sophisticated testing equipment which are fabricated to withstand compression force of 5,000 tons and shear displacement of 1,000 mm. The equipment is deemed to be the largest in Asia. 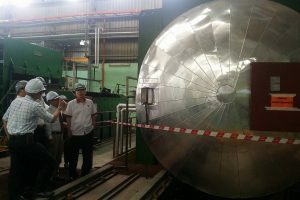 lexible industry: Mah (second from right) examining the rubber compound production line during his visit to Doshin Rubber Production in Klang. Looking on is (from right) Doshin Rubber managing director Or Tan Teng and Kossan Rubber Industries Bhd managing director and chief executive officer Datuk Lim Kuang Sia. KLANG: Many foreign companies are using Malaysian-made rubber materials in their construction industry, but local firms continue to rely on imports. 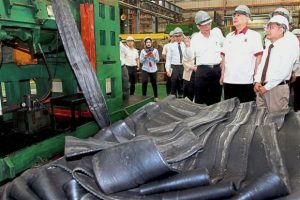 Describing the situation as “ironic”, Plantation Industries and Commodities Minister Datuk Seri Mah Siew Keong urged local firms to buy Malaysian-made rubber materials. “Many foreign countries are using our products, but Malaysians are not. I think this must change,” he told reporters during a visit to Doshin Rubber Products (M) Sdn Bhd here yesterday. “We still have projects in Malaysia using overseas products just because they are from overseas. It is the mindset that everything from overseas is better. “I urge everyone in the construction industry to look back at Malaysian products and do a technical assessment,” he said. Mah said he would suggest that the Government identify a way to ensure the use of Malaysian-made rubber building materials, especially in big and mega projects in the country. However, he said that he was not propagating a protectionist stance and that industry players could carry out their own evaluation before buying local products. He said there were currently several mega projects in the country, such as the East Coast Rail Link (ECRL), which could use local products. While encouraging foreign investment and contractors, the projects, said Mah, must use local products if these were found to be of equivalent or higher quality and not more expensive. Brushing aside claims that rubber was a sunset industry, Mah said the global market for its products was worth over US$500bil (RM2.2tril). Companies like Doshin, he said, kept the country’s rubber industry competitive by buying most of its supply, adding that this was very good for the 450,000 smallholders. Mah, who is also Gerakan president, congratulated Puan Sri Jamilah Anu for her landslide victory in last weekend’s Tanjong Datu by-election. Mah said Jamilah obtaining 96.5% of the votes cast was reflective of the moderate stance taken by her husband, the late Chief Minister Tan Sri Adenan Satem. 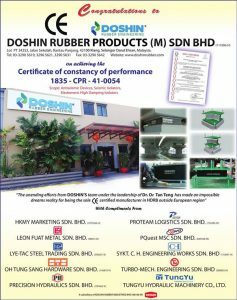 KUALA LUMPUR: Kossan Rubber Industries Bhd’s 70% owned subsidiary, Doshin Rubber Products (M) Sdn Bhd, plans to enter into a joint venture to supply anti-vibration system for railways, buildings and bridges along railways for the entire China market. Kossan, which makes rubber products such as surgical and examination gloves, told Bursa Malaysia that Doshin signed a memorandum of agreement (MOA) with Shanghai Tongji University Tong-Tech Metro Vibration Control Co Ltd (TMVC) on Wednesday with the aim of forming a strategic alliance to jointly design and manufacture this anti-vibration system for the market. Under the terms of the MOA, Doshin will make the floating flab, base plate vibration isolation technology and rubber pad based on designs supplied by TMVC; undertake joint product development, design, trial production and manufacture of the products; and conduct a technical seminar. TMVC, meanwhile, will promote other relevant products manufactured by Doshin for China’s projects; undertake joint product development and design; provide technical support to any projects outside China on request; and undertake market development and provide technical service. Kossan said the MOA came into effect on the date of the signing, adding that the memorandum might be cancelled by mutual agreement at any time. 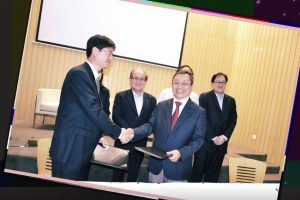 In September 2014 Doshin had signed a memorandum of understanding (MoU) with Institute of Rail Transit of Tongji University in Shanghai for a strategic alliance to design, manufacture and market development of rubber pads for floating tracks. The MoU would remain in effect for two years (to Sept 2016), but up to March 31, there had been no further development. Kossan shares gained 3 sen to close at RM6.49 on Wednesday. Universiti Tunku Abdul Rahman (UTAR) and Doshin Rubber Products (M) Sdn Bhd signed a memorandum of understanding (MoU) at UTAR Petaling Jaya Campus on 13 May 2011 . With the signing of the MoU, UTAR, a leading private not-for-profit university in Malaysia, and Doshin, a subsidiary of Kossan group (listed on Bursa Malaysia), formally agreed on working together in areas of common interest, including intensifying research into earthquake-resistant rubber base isolators for buildings, bridges and other structures. Doshin, established in 1978, is the pioneer in manufacturing laminated bridge bearing pads and building base isolators. It has over 30 years of experience in providing rubber solutions for the civil engineering and construction industries. Signing on behalf of the parties were UTAR President Ir Professor Dato’ Dr Chuah Hean Teik, and Director of Doshin Rubber Products (M) Sdn Bhd Or Tan Teng. UTAR Vice President (R&D and Commercialisation) Professor Dr Lee Sze Wei and Doshin’s Executive Director Lim Siau Hing signed as witnesses. Under the MoU, the partners would work towards jointly holding a patent of an improved rubber base isolator with greener, more sustainable and economical features. The two parties were also keen to commercialise another product called ‘energy-efficient aerated lightweight block/panel’ patented by UTAR recently. “The strategic collaboration between Doshin and UTAR can be an important determinant that it contributes towards the emergence of a well-integrated industry-focused and demand driven innovative new product,” said Or. Doshin had sponsored an engineer, a UTAR graduate, to pursue a Master’s degree related to the application of rubber base isolators in UTAR. More Doshin’s staff members, including those from the top management, would be expected to pursue Master’s and PhD degrees in UTAR in the future.